Kirigami is a form of art in which paper is deformed and bent into the desired shape. Originating in Japan, it is similar to origami, with the exception that cutting is also permitted in this discipline. The principles of kirigami can also be applied to the cutting or impression of patterns into thin layers of metals, most often gold. This has been one of the goals of physicists as the results from this technique can be used to bend light at the nanoscale, and also to prove that such precise work is possible. However, the results of performing this art manually, with blades or other implements, can be inaccurate, can give poor-quality shapes, or go wrong in other respects too. A team from MIT have recently showcased their new and improved nano-kirigami technique, which results in the ideal light-bending, raised cut-outs. Besides being an impressive and intriguing achievement, the concept in gold foil (as in this project) has potential roles in optics and diagnostic technology. The objective here was to create tiny ‘pinwheels’ out of the foil that was bent upwards from the rest of the layer (approximately 80nm). These pinwheels were designed to filter out the light of a particular polarity at the nano-scale. This was done for increased accuracy and precision in the filtering. The scientists, led by Dr. Nicholas Fang of the Department of Mechanical Engineering at MIT, also collaborated across the Chinese Academy of Sciences and the South China University of Technology. The team realized that the actual mechanical cutting would not offer the results they expected. Therefore, the researchers turned to focused ion beam (FIB) technology, which could cut patterns into the nanometric layers of gold by displacing or removing specific gold atoms. This process, known as FIB milling, was followed by a more widespread FIB bombardment or irradiation. This caused the gold on one side of each ‘cut’ to rise up, away from the vertical, into delicate little curves. The precise nature of these curves was determined by the extent of the FIB bombardment. The entire process yielded a custom pieced of ‘nano-kirigami’ in the form of a miniature pinwheel pattern cut into the gold foil. 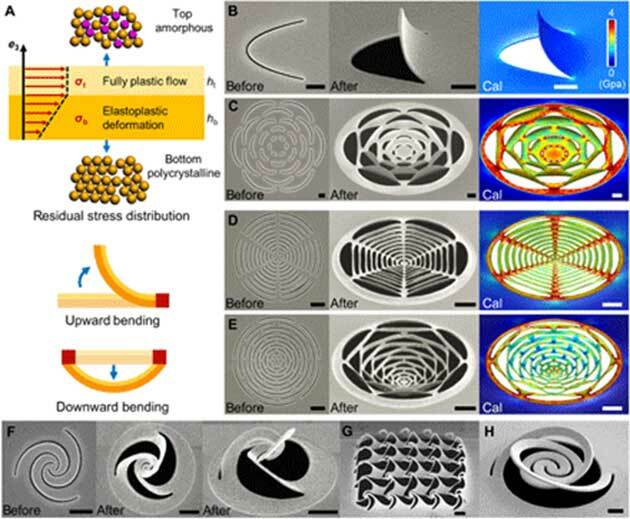 Fang and his colleagues used gallium ion FIB to create their kirigami shapes. They reported that this resulted in the required bends due to the interaction of compressive and tensile stresses placed on the gold due to the presence of the ions. For example, the displacement of certain gold atoms resulted in grain coalescences (in which the remaining gold atoms in the vicinity shift around to compensate). This, in turn, resulted in tensile stress, which was accompanied by the compressive stress of some of the gallium becoming incorporated into the film. These factors influenced the stress in the lower half of the gold foil, which accordingly determined the ‘folding’ into curves. The team reported that, of the two, tensile stress appeared to affect upward bending more, and this, in turn, was influenced by the acceleration voltage (in kilovolts) of the FIB beam. But this information was only so good as the ability to control, replicate and tune these parameters, done using complex modeling. The process was necessary as the nano-kirigami process required, among other things, a linear distribution of elastic stress and constants of tensile strengths in order to produce the desired 2D shapes on top of the gold layer. This model successfully resulted in the creation of simple pinwheels, in addition to more complex topographies that resembled petals, spider-webs and complex, rising spirals. These shapes were built at the micrometric scale, and again, cut into the 80nm-deep gold foil. Some of these nano-kirigami shapes had exceptionally desirable optical properties, and most notably, impressive chirality. This meant that they could be used to differentiate between the light passing through right-handed and left-handed molecules of the same compound. Many substances, including glucose, are a mixture of both. The above is a potentially valuable property, as analytical and diagnostic tools may not distinguish between the two types of molecule in a sample. They may only be able to detect the concentration of molecules with one chiral center. Fang now asserts that optical sensors, based on his new form of nano-kirigami, will lead to better monitoring and testing for patients with conditions such as diabetes. 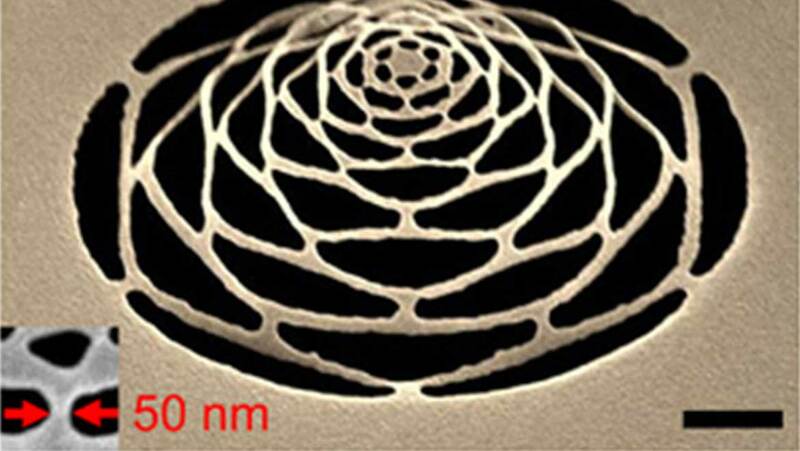 Nano-kirigami may also have a place in communications-related optics. In other words, the concept can keep the light from different laser sources separate, even in an enclosed space such as that found inside a fiber-optic cable. This new technique can be regarded as 4D manufacturing because the processed materials undergo additional changes (i.e., bending away from the vertical), over time. It is also a relatively simple process, albeit one in need of tight control using models, and possibly, machine learning. In addition, FIB is also often employed in the manufacture of products such as microprocessors. Therefore, it may be relatively inexpensive and easy to adapt to the needs of nano-kirigami. The ability to produce tiny, regular patterns, a couple of micrometers across, is an impressive achievement of nano-engineering. However, its results may represent significant improvements for certain optical devices and applications. It is to be hoped that the discipline of nano-kirigami becomes even more refined and enthralling in the future. Z. Liu, et al. (2018) Nano-kirigami with giant optical chirality. Science Advances. 4:(7). G. P. Collins. (2016) Science and Culture: Kirigami and technology cut a fine figure, together. Proceedings of the National Academy of Sciences. 113:(2). pp.240-241.